The Alumni Conversation and Mentorship is a brand new initiative by the AAA-C with an objective to promote engagement of prominent scholars, successful alumni and leaders in society with our members. The alumni conversation and mentorship session is organized in a professional round table dinner-style and is exclusive only for AAA-C members to have a conversation and receive mentorship from high profile and prominent senior individuals or alumni. The inaugurating session of a new initiative “Alumni Conversation and Mentorship series” was successfully convened on the 27th September 2016 with the attendance of our guest mentor, H.E. Dr. Sok Siphana and 10 alumni members. The Alumni Conversation and Mentorship session is organized in a professional round-table dinner setting at Malis Restaurant and is exclusively for AAA-C members to have a conversation and receive mentorship from a prominent senior individual. This session, the focus of the conversation is under the theme of “Law and Legal Affairs” guest-mentored by H.E. Dr. Sok Siphana who has years of experience in the field of legal affairs and is the founder of one of the most renowned lawfirms in Cambodia, SokSiphana&Associates. H.E. Dr. Sok Siphana who is currently serving as the advisor of the Royal Government of Cambodia has shared with our alumni his personal inspiration and journey leading up to the establishment of his lawfirm to be one of the most reowned in the country, and his experience working with many internation organisatoins most noticeably the International Trade Center (ITC), UNDP, the World Bank and the Asian Development Bank in various capacities. H.E. 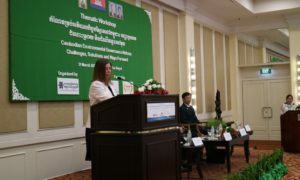 has also offered many insightful inputs on the advancement of Cambodia’s legal system and advice on how to advance in terms of career prospect.